Debtmerica Relief provides debt assistance to individuals and families who are experiencing financial troubles and need a way out of their debt - without having to resort to bankruptcy. 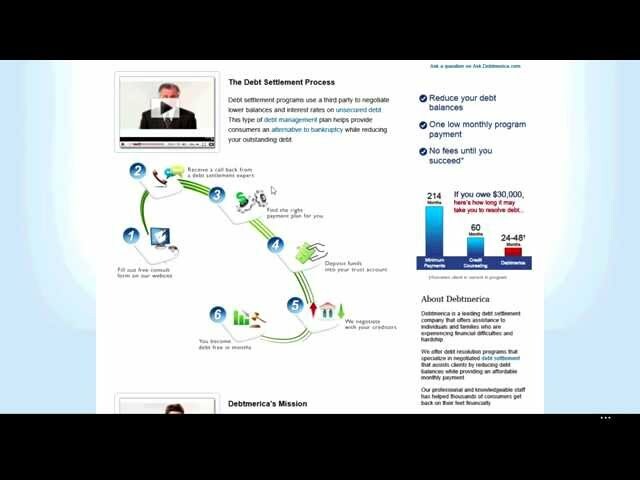 The goal is to enable you to get out of debt so that you can get on with your life. Founded in 2006, Debtmerica Relief is a debt settlement company that has grown to become one of the leading debt settlement companies in the US. The service has been featured on MSNBC, FOX and CBS. The service will help you to get out of debt in the shortest amount of time. Their licensed consultants will help you to find the least expensive way to eliminate your debt. You start by completing a brief questionnaire. After that, you will receive a call back from one of Debtmerica’s licensed settlement consultants. You select the right settlement plan for your finances and circumstances, and then begin depositing money into your settlement trust account. Debtmerica uses the funds in the trust account to negotiate lower payoff balances with your creditors, enabling you to become debt-free in a matter of months. The website indicates that debts can normally be settled for between 15% and 75% of the actual amount owed. Debtmerica enables you to resolve your debt problems in as little as 24 to 48 months - less time than is generally required to payoff a debt consolidation loan. The program provides for low monthly payments. There are no upfront fees, and you will not be charged a fee until a credit account settles. Debtmerica also has a partnership with Credit Karma that will give you free access to your credit score. Debtmerica Relief is an accredited member of The American Fair Credit Council (AFCC), the leading association of professional Consumer Credit Advocates. Debtmerica Relief has been independently review by AFCC for compliance with the AFCC code of conduct, considered to be the strictest in the debt settlement industry. In addition, Debtmerica and its consultants are all members of the International Association of Professional Debt Arbitrators (IAPDA). Consultants are required to go through the IAPDA certification program. When you sign up for the Debtmerica program, you will be assessed a fee that is specific to the debt settled, though no upfront fee will be collected. The debt settlement program however is performance based, so you will not pay a fee until settlements have been negotiated. Fees range between 20% and 24% of the enrolled debt balances that are settled. Once an account has been settled, the fee will be charged for that specific account. Fees will be paid out of the special purpose account that is established to accomplish your debt settlement. Monthly payments will need to be made in order to fund the trust account, which will be negotiated based on your financial situation. You can contact Debtmerica Relief by mail, email or toll-free phone. Hours of operation are from 7 am to 7 pm, Monday through Friday, and 9 am to 2 pm on Saturday (all times Pacific). There is also an outstanding Debt FAQs page, that will give you a thorough education on how the debt settlement industry works, including pitfalls. It includes information to help you to spot debt settlement scams - good information to have even if you don’t use Debtmerica Relief.